*Do not use your own email address. That won’t work! Feel free to let me know if you come across any issues. The only thing so far that I can’t seem to fix is that you can’t just search things under the search bar, you need to click the magnifying glass first and do an advanced search. Enjoy! Click here to search all indexed BIRTHS in Pescara. I’m fooling around with some free online databases to make all the records I’ve been working on easily searchable. Using a free app on Zoho.com, I think I might have found the right one! 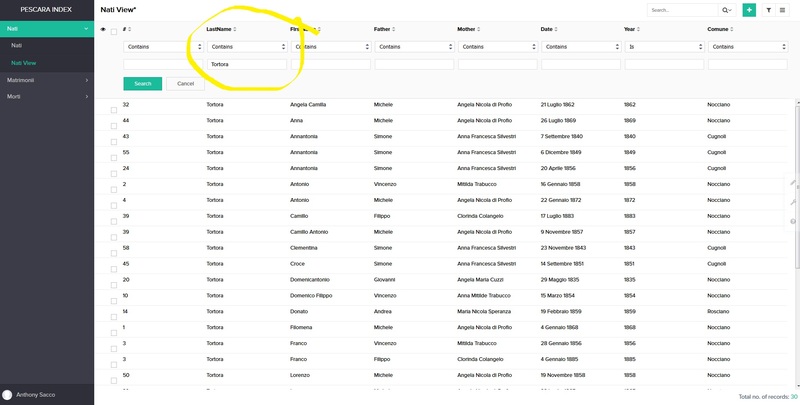 My goal is allow you to look up the main data pieces on the record (name, parents, date of birth, record number) and then if you wanted to view actual record you’d know exactly where to go on the Italian National Archives or Family Search websites. It’ll also be good if you’re looking to see if any families appear in more than one town. Care to take a stab at the link below to let me know if it works? I’m basically trying to find the most user-friendly interface. All the records there are searchable my clicking “Search” and you can just type the name you’re researching under the appropriate field. For example, if you want to search for individuals with the last name “Trabucco” in the town of Civitaquana, just put Trabucco under Last Name and Civitaquana under Comune. NOTE: If you put in more than one search term, it will only pull up records that meet ALL of those terms, not records that just meet one or two terms. Since I started amassing a database of people from Nocciano in the 1700s and 1800s, the name SAVINI has appeared so often that you would think the family has been around in the town for centuries, if not longer. With the help of the church records, I’ve been able to bring the SAVINI family all the way back to one individual who moved to Nocciano from Vicoli sometime during the 1700s – Michele Savini. Here’s how. While I don’t have any direct SAVINI ancestors, many in the family have married cousins and aunts and uncles 100-200 years ago, so their descendants end up related to me one way or another. They had one child and Anna Rosa died a year later in 1770. Valeriano then married Cecilia Marcucci in 1771. They had 5 children, and though none of those baptism records say Valeriano was the son of Michele Savini, it is pretty reasonable to assume so. This Giuseppe Savini married Massimina d’Agresta and had several children in Nocciano. Also, Domenicantonio Savini (1787-1831) married Camilla Palumbo, and Palma Antonia Savini (1795) married Romualdo Salci. The fifth child, Domenica Savini, married Vincenzo di Felice in 1776 (Image 6) and they had 5 children in Nocciano. Both died before the civil records began, so there are few records of them outside the church records. I was able confirm the death records by looking at the processetti for the marriage of Gaetano di Felice in 1811. The sixth child (I think), Anna Eleuteria Savini, married Gervasio della Piana in 1785 and had 6 children. Anna Cleria Savini also died in 1801, before the civil records, but having gotten married last it looks like she is the youngest child. Since she wasn’t born in Nocciano (no baptism for her in the Nocciano book), she must have been born in Vicoli, which means the family must have come here sometime after about 1761. It also means that we should be able to find the census record for Michele Savini, Rosalia, Valeriano, Silvestro, and perhaps Lodovico in the town of Vicoli when we look at the Catasto Onciario on the FamilySearch website as soon as that becomes available. Anna Cleria/Chiara married Domenico della Rosa in 1786 and had two children. Now there is at least one other Savini family (well – derived from Savini, but not bearing the last name) in Nocciano that I can’t quite connect back to Michele, and this would need to be confirmed through the census records as well. There’s a marriage in 1776 for Liborio Marchionne and Berardina Savini, with no parental information. And no baptism records say if she is from Vicoli or if she is the daughter of Michele. My guess is she’s one of the eldest children. Some other Savini families: Natale Savini-Anna Domenica Riccitelli, who had children and died in Rosciano, but I haven’t yet found if they were originally from Vicoli, and the Taddeo Savini of Civitaquana (all Savini’s in Civitaquana go back to him, and he’s originally from Vicoli – he’s Michele Savini’s generation, for all I know, they’re brothers!). There’s also some Savini’s in Pianella but I haven’t explored them yet. So all the Savini’s pretty much go back to the town of Vicoli. If you’re a Savini – I’d start taking a look at the Vicoli records to see if you can connect to any of them! If you’ve been researching the CETRANO family, you may have seen the name in Civitaquama, Nocciano, and Catignano. It is most common in Civitaquana, where I believe the name originated, but in my direct ancestry, I’m connected to Cetrano’s in Nocciano. Tree for my two great-grandmothers who were sisters, Chiara and Rosaria di Meco. Not only am I related to the CETRANO family through my two great-grandmothers – Chiara (wife of Pasquale Speziale), and Rosaria (wife of Vincenzo Scardetta) – but I am also connected through Giulia d’Amico, another great-grandmother. Tree for my great-grandmother Giulia d’Amico, wife of Palmantonio di Virgilio. You can see that all CETRNAO lines in Nocciano take us back to one couple: Mattia Cetrano and Maria Giuseppa d’Intinosante. It wasn’t until I looked at the church records of Nocciano that I found out there was a whole other CETRANO family in Nocciano, Nicola Cetrano and Anna Saveria d’Intinosante. Normally there is at least some record in the civil records that points to an existing family – some death record, some unfamiliar name, etc. In this case, not a single member of this family survived past 1809, so there was no trace of the family in the Italian civil records. To start, there are the marriage records for these two couples (Image 3). From these records we find that Mattia and Nicola Cetrano are from Catignano. While it is usually likely that couples that got married on the same day are siblings (Mattia & Nicola, Maria Giuseppa & Anna Saveria), it doesn’t necessarily prove it. 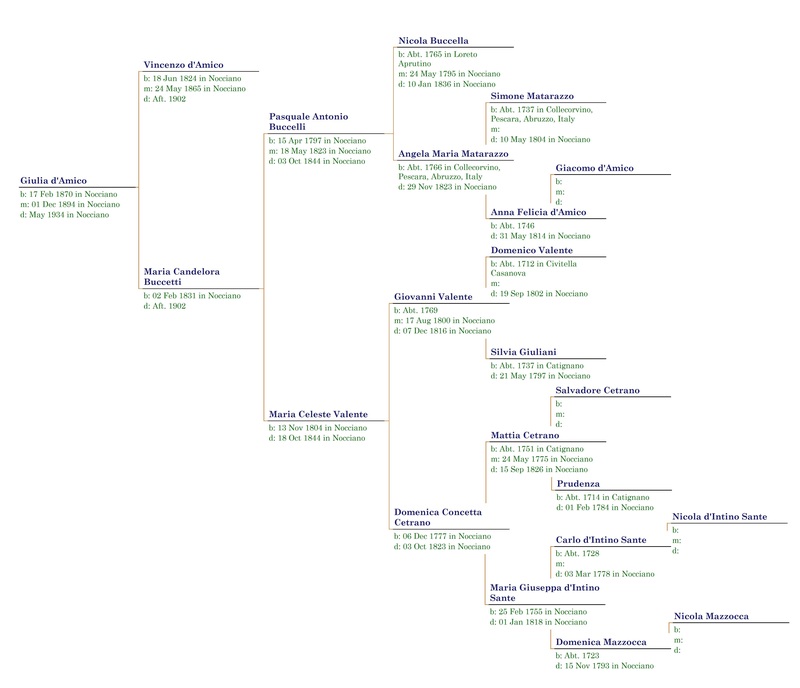 From having the marriages on the same day, both being from Catignano, and having the name Salvatore appearing in record, it’s pretty safe to connect Nicola and Mattia Cetrano as brothers. Nicola died in 1787, and all of his children died young, so there were no surviving members of his family. So these records connect the CETRANO’s in Nocciano to the CETRANO’s in Catignano. Nicola and Mattia were born in Catignano as the marriage records say. The next question is: are the CETRANO’s in Catignano originally from the much larger family of CETRANO’s in Civitaquana. It’s very possible that Salvatore Cetrano, who we have very little information about (not even a death record), was originally from Civitaquana, married Prudenza (whose last name we don’t know), who was from Catignano, had children in Catignano, and then the whole family moved to Nocciano where their two sons Mattia and Nicola had families. That’s my guess! The answer remains to be seen. Marriage record of Nicola Cetrano-Anna Saveria d’Intinosante and Mattia Cetrano-Maria Giuseppa d’Intinosante. Death record of Mattia Cetrano in Nocciano. Baptism record for Massimo Antonio Salvatore Cetrano, son of Nicola Cetrano and Anna Saveria d’Intinosante. In the last several posts I’ve been diving into the history of specific families in the towns of Nocciano and Civitaquana and posting a few of the actual church records – baptism, death, census, marriage records – that I dug up on my trip to Italy in November. I thought I’d take a second to explain exactly how to read a baptism record and extract the necessary information. As if reading Italian records wasn’t enough of a challenge, half of these records are in Latin, which I’ve been lucky enough to have studied closely since 7th grade. The first date in a baptism record is the DATE OF BAPTISM (17 Mar 1766). Don’t confuse this with the date of birth. Sometimes it’s on the same day; sometimes it’s not. Here it says “nata in quest’oggi su le hore 17” (born on this day at hour 17), so in this case, the baptism happened on the same day as the birth. In an Italian record, the FIRST NAME of the child usually comes right up front – here it’s Maria Antonia. It says she’s the “figlia legitima e naturale” (abbreviated in the record), which means “legitimate and natural child”. A child born out of wedlock would be “natural” but not “legitimate”, so that record would say “figlia naturale”. Then it lists the PARENTS (Felice Palumbo and Susanna Napolione). Sometimes we’re lucky and the record will have the parents’ fathers (or even grandfathers’) names. It also gives the name of the person who held the child in the holy water (Bernardina d’Amario) and the midwife (Santa Palumbo). The priest’s name was D. Carmine de Paschinis. Again the date of baptism is given at the top (“duodecima Januarii 1789” = 12 Jan 1789), and it says she was “natam die qua supra” (born on the day here above), meaning born on the same day as the baptism. Parents were Vincenzo ([son] of Leonardo Ranalli) and Brigida ([daughter] of Andrea de Santedicola). The child was given the “nomen” (name) Antonia. The person holding Antonia in the holy water was Petronilla di Giovannantonio and the midwife was Antonia Cassielli. Here you can see the baptism date (“Die quinta mensis Julii 1789” = 5 Jul 1789), and then it says “natum post solis occasum diei praecedentis” (born after the setting of the sun of the preceding day = 4 Jul 1789). We also have some extra information about the mother here (“…et Annantonia dè Petro dè Nicolao-Antonio dè Profio). The mother was Annantonia di Profio, her father was Pietro di Profio, and her grandfather was Nicolantonio di Profio. These are all Civitaquana baptism records – too bad the Nocciano records aren’t nearly as helpful with the parents’ families.